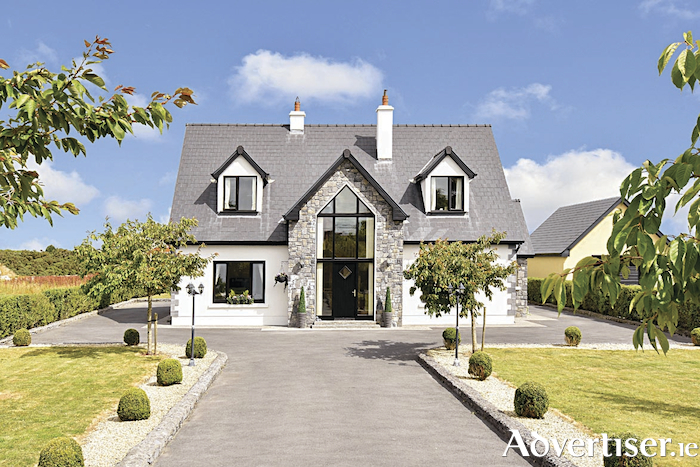 Mullery auctioneers is currently offering for sale a stunning detached residence set in beautiful gardens and located on a quiet road at Knocknagreine, close to Barna village and Furbo. Ocean View has been exceptionally well maintained and is presented in excellent walk-in condition. The residence boasts bright and generously proportioned accommodation. The hallway is a superb double height space with large glazed sections allowing light to pour in. Off the hall to the left is the living room with feature open fireplace and wooden floors. On the opposite side of the hall there is a spacious open plan living/dining room/kitchen with solid fuel stove. The kitchen is fitted with a range of units and includes integrated appliances. A utility room and large walk-in hotpress are situated off the kitchen to the rear. Also on the ground floor are a study/playroom, a double bedroom with en suite, and a guest wc. Moving upstairs, there is a large gallery-style landing. The master bedroom is a wonderfully spacious room with walk-in wardrobe and en suite. There are a further two bedrooms and a well-appointed main bathroom.